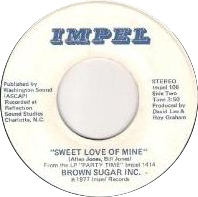 So what do we have here then – a fairly well known label out of North Carolina, Impel, which is probably most famous for the original release of Ann Sexton’s, ‘You’ve been gone too long’. Here we have a priceless piece of Soul. Recorded at the Reflections Sound Studio’s in Charlotte, the whole project is produced by David Lee, the man responsible for the Impel label set-up, as well as for writing the Ann Sexton track. Inspired by the 50’s label, Imperial, David set things in motion by finding & recording local Carolina artists in any number of styles, from funk through pop, country & Soul. There are allegedly 10 releases on the label, although as yet, nothing really as Soulful as this 45 has been found. This ‘b’ side was written by Alan & Bill ‘Sugar Billy’ Jones, well known artists from the area. Well what makes this special for me then ? You’d have thought with such a relatively small label, the budget wouldn’t make it possible to produce such a strong sound, but what we have here is a simple guitar, throbbing base & drums all tucked up in one corner & the members of Brown Sugar Inc, including the Brothers Jones, belting the track out in another ! The storyline is simple – please don’t take your love away ! The lead vocal & falsetto interweave beautifully, building up to a climax where the boys finally plead just one more time, ‘I love you, please don’t leave’ . . . I guess we can all work out the final scenario. As a footnote, David Lee is still alive & living in North Carolina. At the moment I can let you know that a full retrospective of his work from the 60’s to his final recordings in the 80’s, is being put together, with a vinyl release being pencilled in for the spring of 2010. With a real ‘smorgasbord’ of styles as mentioned, pop, country, Soul & even some opera, recorded for the 3 labels David ran, a real eclectic mix can be assured !